Could Donald Trump Really Send Astronauts to Mars in the Next Seven Years? The White House would cut off funding for the International Space Station in 2025 and lean into a future of commercially operated habitats in low-earth orbit, according to draft National Aeronautics and Space Administration (NASA) budget documents shared with Quartz ahead of their official release Monday (Feb. 12). The documents show an administration that is eager to put a new emphasis on human space exploration, but unwilling to spend enough to dramatically speed NASA’s long-term—and long-delayed—plans to return Americans to space without leveraging growing private investment. 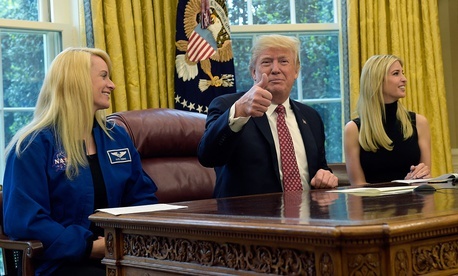 President Donald Trump’s 2019 budget request envisions NASA working closely with the private sector on every level, from outsourcing ground-to-space communications to landing on the moon, while focusing its own efforts on technology to take people into deep space. The budget would increase NASA’s spending by $375 million, to just under $20 billion annually. The White House expects to stop spending on the International Space Station within seven years, and plans to create a new $150 million program to prepare private companies to take over operations on the ISS, or to replace it with their own space habitats. Bigelow Aerospace, which has a habitat hosted on the ISS and a dubious extraterrestrial research contract to boot, and Nanoracks, which works with NASA to launch satellites from ISS and with Jeff Bezos’ Blue Origin to fly research payloads, have called for such programs for years. Whether sufficient private demand for human time in space exists to finance these operations remains an open question. While the national lab onboard ISS remains underutilized, some companies (like Bezos, or the founders of Made in Space) think orbital manufacturing has a future, and others think space tourism or resource extraction could be lucrative. The president’s budget also moves ahead to fund new partnerships with private companies to land robots on the moon, and accelerates a plan to launch the first segment of a moon-orbiting habitat on a private rocket by 2020. It would modestly increase spending on vehicles to explore deep space, particularly a rocket called SLS being built by Boeing and a spacecraft called Orion built by Lockheed Martin, which is expected to fly its first mission in 2020. It also funds new spacecraft, built by Boeing and Elon Musk’s SpaceX, that are expected to fly astronauts to ISS next year. None of these changes are likely to significantly speed the return of astronauts to the ISS or beyond, though they could provide a boost to private companies that hope to move more rapidly than the government when it comes to space exploration. To do all this, the White House budget cuts $100 million from ISS’s operating account, eliminates NASA’s independent education program, and reduces funding for earth science. Trump still wants to shut down DSCOVR, the climate-change monitoring satellite perched between the earth and the sun, as well cancel several future earth science satellites proposed by NASA scientists. The budget also directs NASA to replace the satellite ground systems it uses to communicate with its spacecraft with privately-operated alternatives. The lawmakers who will finalize NASA’s spending plan in the months ahead are likely to make significant changes to this vision. Though its costs are seen by some as weighing down the entire space program, others are reluctant to decommission the ISS after investing billions of dollars in the project. Indeed, so far, Trump has been unable to even confirm his controversial pick, Oklahoma congressman Jim Bridenstine, to run the space agency.